In bathroom redesigns, so much energy and thought is put into flooring, showers, vanities, cabinets, heating, and fancy finishes that often leave the bathroom window coverings last on the list, if they are thought of at all. Poor, windows. Bathroom interior design is turning the modern bathroom, especially the master bathroom, into mini spas with luxurious features and finishes. Often these spa bathrooms have big, beautiful windows that allow in tons of natural light giving the bathroom and its occupants nice, sunny rays to bask in. But what about a little privacy when the bathroom is in use? Are you looking to add a little more privacy to your bathroom, or do you just want window coverings that contribute to the great design your bathroom already has? Where the window is located in the bathroom. The amount of moisture the covering will receive. How much use the window covering with get. How much maintenance and upkeep the windows will need. How much light you want or need to let in. We have broken this all down for you below to get you ready for your new (or new to you) bathroom window treatments. First, you need to figure out which window covering works best with your bathroom. Privacy: How much privacy do you need? What shades or blinds will give you the privacy you want? Light: How do the blinds or shades allow for natural light to come into the bathroom? Is there transparency or are they roll up / top down? Durability: The bathroom is one of the moistest rooms in the home. Is the window close to the shower or tub? If so, then you need to pick a covering that can withstand that level of moisture. Maintenance: Will these coverings be opened and closed often and will they be easy or difficult to clean? Curtains and Drapes: Curtains of the right fabric can be perfect for the bathroom. Fabrics such as lace give you some privacy, let natural light in, and will dry quickly. You can also wash them easily. Remember, you also have the option of just adding curtains to the bottom half of your window, allowing a bit of extra light to stream in, while still giving you your privacy. Shutters: The slat of a shutter makes it easy to let light in while also blocking viewing from the outside for privacy. Shutters also allow you to open the window to let in nice breezes while still maintaining your privacy. Shutters can be cleaned easily and moisture is not much of a factor so long as they are not wood blinds. Plastic or aluminum shutters are perfect for and fairly common in bathrooms. 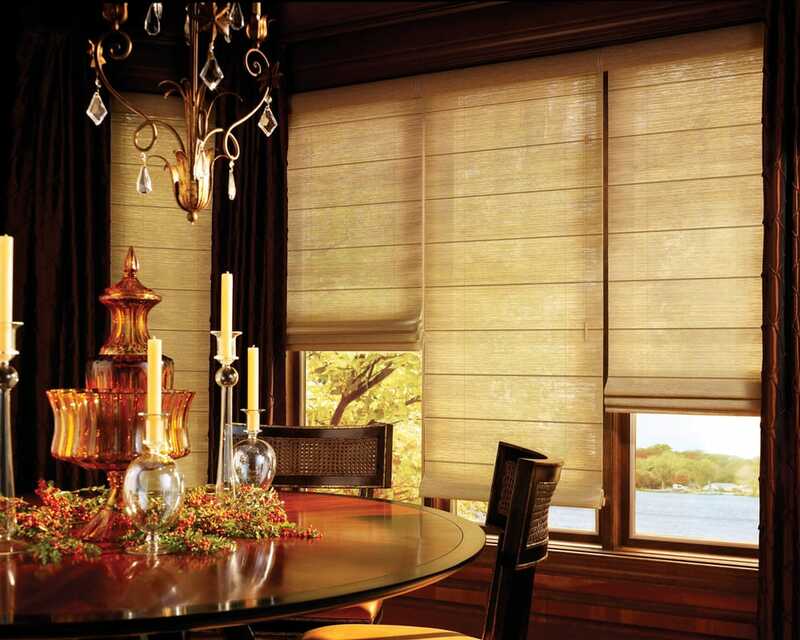 Blinds: Blinds are great because you can purchase sets in various materials. A nice choice are Roman blinds because hey “offer the soft texture of fabric with the flexibility and convenience of Venetian blinds: They fold up flat when you want to allow some light into the bathroom but can be left down for privacy.” If you opt for fabric blinds, be sure you are ready to clean them regularly, otherwise, there can be a buildup of mildew. You can also go with a great wood blind, allowing for sound absorption, making your bathroom experience much more quiet and peaceful. Roller Shades: In modern home design roller shades are making a statement. Roller shades are one of the best accessories for your home because they are affordable, functional, and versatile. Roller shades can be a great addition to any bathroom. Whether you enjoy casual roller shades or refined Roman shades, roller shades give you many options for great bathroom design and home decor. If you are on the hunt for new window treatments for your bathroom, keep these tips in mind and you are sure to find something that fits your design and decor needs, and becomes the perfect addition to your bathroom.